A tense situation is unfolding between Turkey and Syria after the latter shot down a fighter jet belonging to the former. According to Turkish officials, one of their aircrafts was shot down while in international space. Authorities are now convening with NATO allies to decide what kind of measures should be taken in response. Syria claims that the jet crossed over to its airspace, which is a violation of its sovereignty. Members of NATO will be gathering for a conference in Brussels to discuss the issue. No military action is expected at this point. Jihad Makdissi, Syria’s Foreign Ministry Spokesman, said that Syria was merely acting out of self-defense and dismissed claims that the aircraft was in international space. 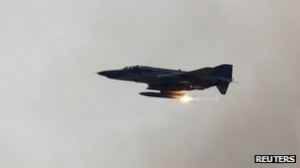 It was also reported in the Syrian media that the jet may have been on an espionage mission and flew over the area to spy on the country’s radar system located in Latakia. Turkey has said that no actions will be taken until it has discussed the matter with NATO, but has warned that the incident will not go unpunished. The matter may escalate even further after a claim that a second plane was fired at while on the search for wreckage of the downed jet. Taner Yildiz, Turkey’s Energy Minister, said that a possible response may be to cut off Syria’s electricity supplies, since Turkey currently supplies Syria with about 10 percent of its power. Turkey has also leaked news that several high ranking military members from Syria have defected due to souring relations between the two nations. Syria, in the meantime, has vowed that it will not stand idly by if NATO responds in an aggressive nature. From the start of the Syrian crisis, Turkey has taken a firm stance against Syria’s government and has provided a refuge for defectors. About 33,000 Syrians have crossed over to Turkey for shelter.